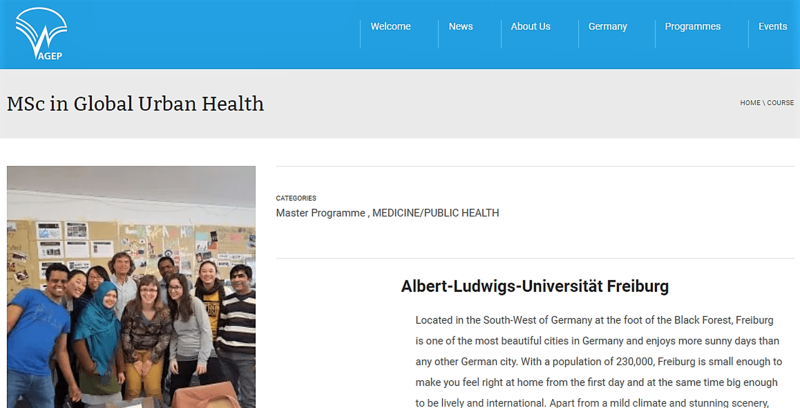 We are pleased to introduce a new programme in our Network – Master of Science in Global Urban Health offered by the Albert-Ludwigs-Universität Freiburg. The one-year, full time programme combines 2 important concepts in health sciences – Global Health that focuses on worldwide improvement of health, reduction of disparities, and protection against global threats that disregard national borders, and Urban Health that looks at the health challenges of the ever growing urban populations worldwide. The AGEP Network welcomes the Programme and wishes many interesting opportunities of collaboration and joint initiatives within the Network!